Until the late 1990s it would have been impossible for me to come here. The whole area was sealed off. 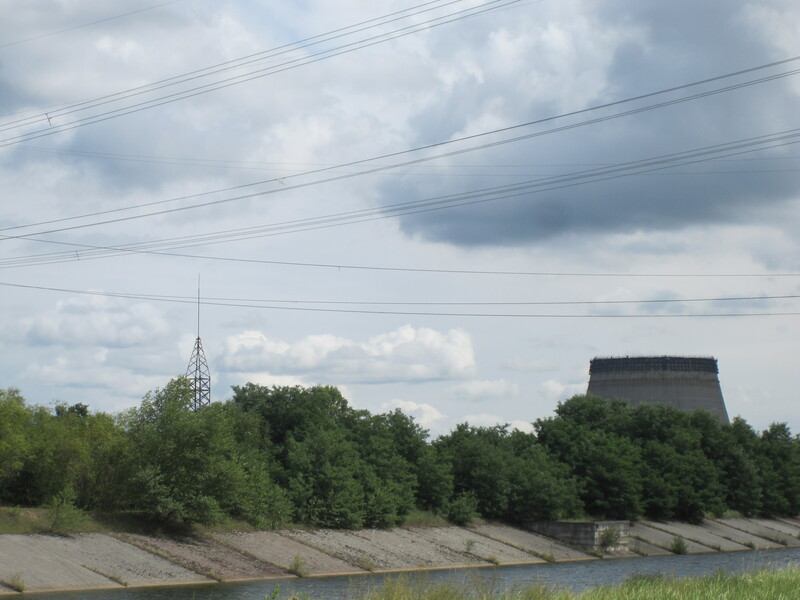 Now though, the United Nations is encouraging “ecotourism” to the former Chernobyl disaster zone in order to help the area get back on its feet. Not one to ignore a call to arms (economic or otherwise), I rushed to book tickets to Kiev, Ukraine for my Italian interpreter and I. Who am I to defy the wishes of the United Nations? However, I think I’d call it nuclear tourism instead of ecotourism. Ecotourism seems a rather disingenuous term as it conjures up images of sleeping in a comfy hammock in the Costa Rican rain forest at a “sustainable” hostel rather than celebrating the true glory that is Chernobyl. Ecotourism or nuclear tourism though, to get to the Chernobyl disaster site one drives two hours north of Kiev, through idyllic, low, rolling hills. Fields of corn and golden seas of wheat spread across the landscape, while islands of pine, cottonwood and birch trees break up the near-flat panorama. Once near the Chernobyl site, one must pass through security checkpoints in two separate exclusion zones at 30 km and 10 km, respectively. After passing through the first exclusion zone, one must make their way into the former city of Chernobyl (now a town if you take its population into account). 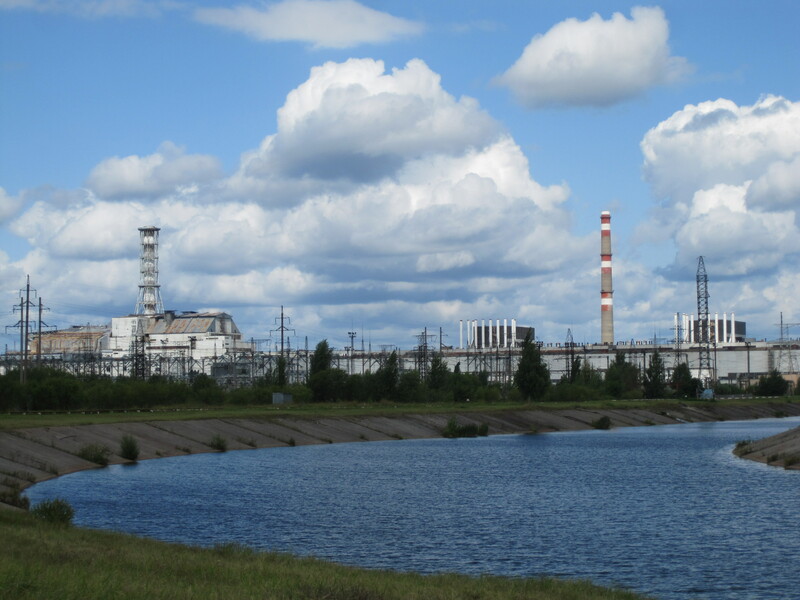 Chernobyl, which the power plant takes its name from, was evacuated shortly after the 1986 catastrophe. 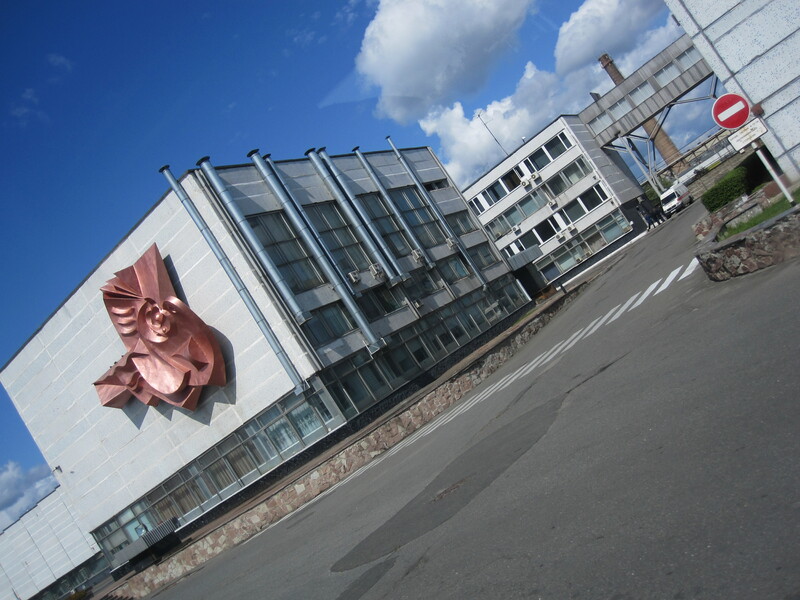 These days, it’s primarily a collection of decaying buildings, many still bearing the CCCP insignia. Some hardy individuals still live and work here though, including the zone’s administrative personnel and a handful of evacuated residents that insisted on returning. Workers in various states of military attire (the fatigues/flip flops combination was a popular choice) walk alongside Lenin Street, past the aboveground pipes and abandoned structures. Once in the town of Chernobyl, you check in along with your driver at the “Chornobylinterinform”, a shabby, yellow building housing the offices of the “Ministry of Ukraine of Emergencies and Affairs of Population Protection from the Consequences of Chornobyl Catastrophe.” We were directed upstairs into a dimly lit room decorated with colorful maps of radiation fallout and photographs of the Chernobyl cleanup efforts. And it is here that you see me signing the “Rules for foreign and domestic delegations to be complied with during their visit to the exclusion zone and the zone of absolute (mandatory) resettlement” which are in reality a waiver for the government of Ukraine. We are members of a delegation, not tourists, we are reminded. Ahhhhh, OK. Cool. It is also here that we meet our guide. 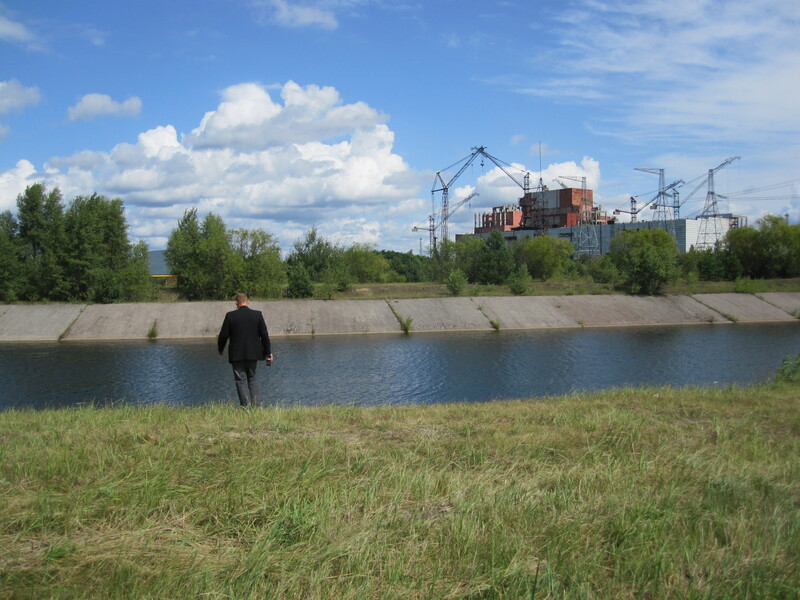 And I’m afraid I’ve forgotten his name, but if he recognizes himself in the pictures below, he can contact me for full credit (Technically, you are allowed into the Chernobyl exclusion zone without a guide if you have written permission from the government of Ukraine. And good luck getting that permission if you are foolish enough to try). Our guide assures me that we are safe. “Maybe two or three visitors become contaminated every year,” he says. “They are always the ones who are most afraid.” He has a theory about radiation, you see. He thinks it’s like children or animals — only attracted to you if it knows you’re scared. 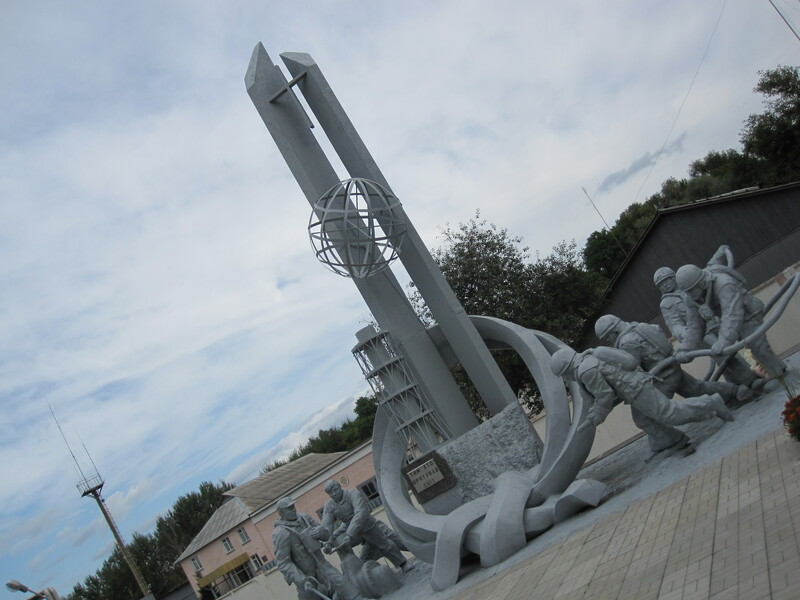 In the city of Chernobyl there stands a very modest memorial to the firefighters who rushed to Reactor # 4 in the immediate aftermath of the explosion. The firefighters who initially responded to the disaster on the morning of April 26, 1986 were not aware that they were entering a radioactive environment, and rushed to the plant without donning protective suits and respirators. While they worked to extinguish the fires, their bodies absorbed astronomical doses of radiation, and most of them died of Acute Radiation Sickness a short time later. As if to drive home this point about ecotourism, the Chernobyl exclusion zone is now a “wildlife reservation.” Our guide describes this as if it were a positive decision by an enlightened government, rather than the inevitable byproduct of evacuating 3,000sq km of irradiated forest. The persistent clicking of the Geiger counter is a pleasant white noise in the background of our beautiful day in the countryside. We pass another checkpoint and enter the 10km exclusion zone that encircles the V.I. Lenin Memorial Chernobyl Nuclear Power Station. Our driver stops again and we find ourselves standing on the empty road staring at large mounds of dirt liberally sprinkled with radiation warning signs. Our guide explained that this was the village of Kopachi and as part of the Chernobyl cleanup effort, the town was bulldozed and buried underneath tons of earth. 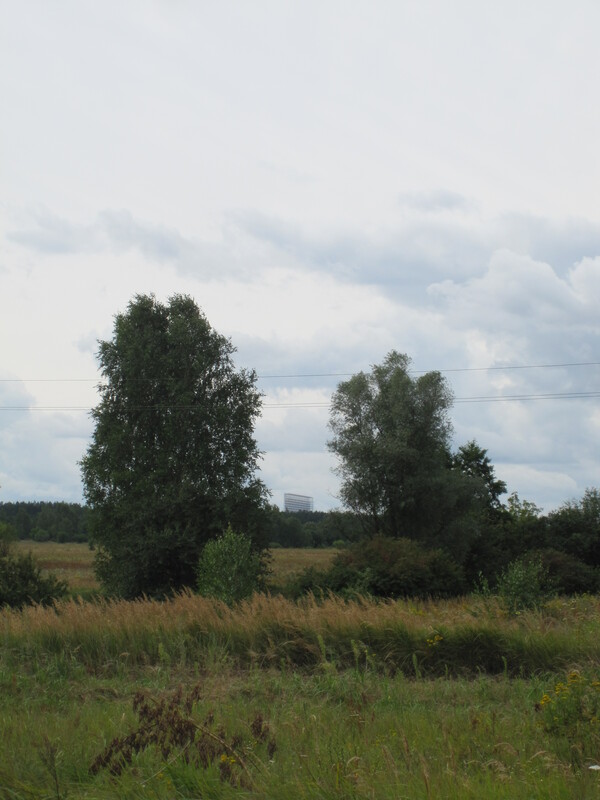 Those mounds in the foreground are the remnants of Kopachi and that strange structure in the distance is part of a large military complex, the Chernobyl-2 radar station, that had to be abandoned after the nuclear disaster. Click, click, click goes the Geiger counter. 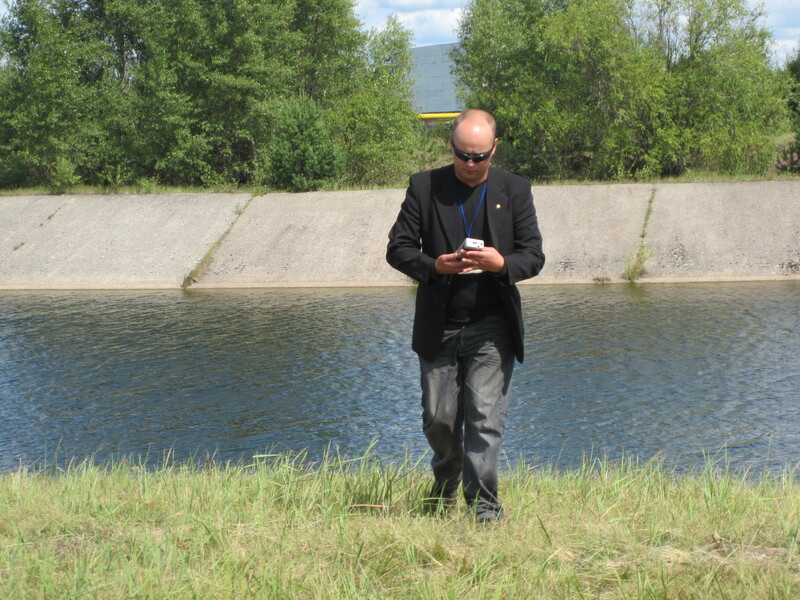 Our guide is checking the radiation levels along the canal. 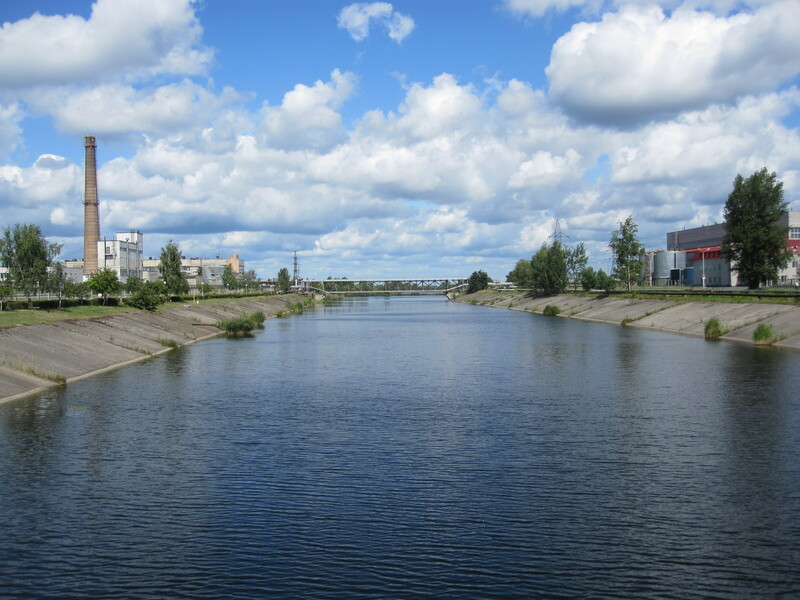 The water in the canal is connected to the cooling ponds which were used for keeping the nuclear reactors from overheating. 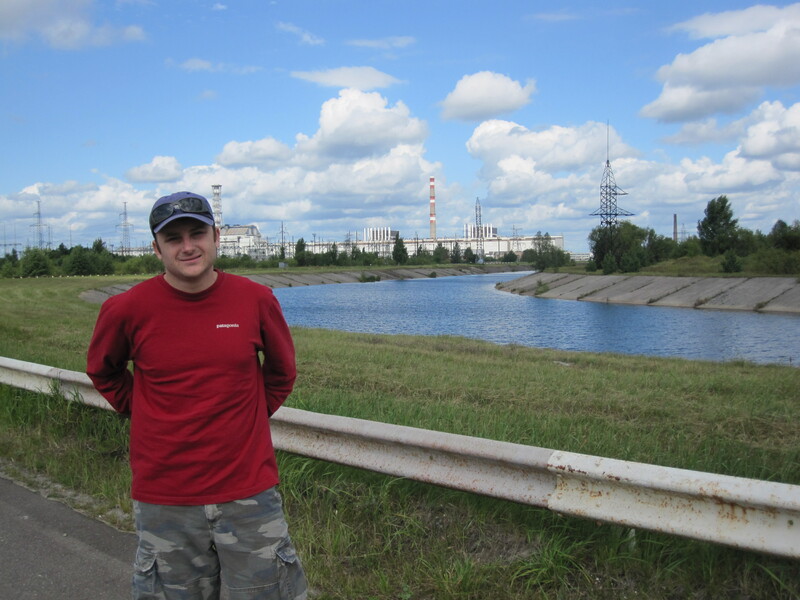 That’s Chernobyl Reactor # 5 behind our guide. 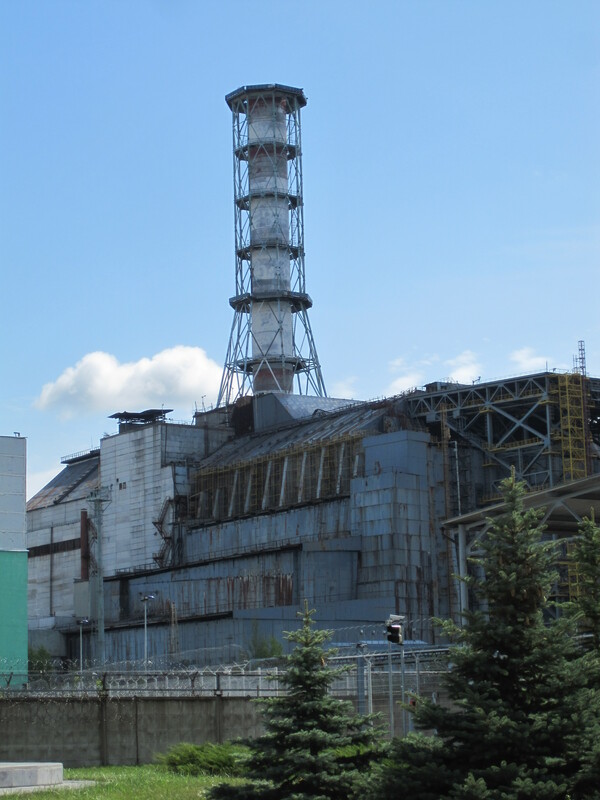 It was under construction in 1986 when Chernobyl Reactor # 4 exploded and then melted down – putting a damper on the Chernobyl #5 construction project. Seemed like a good time to snap a picture of myself as well. In the distant background you can see the power station. A closeup. 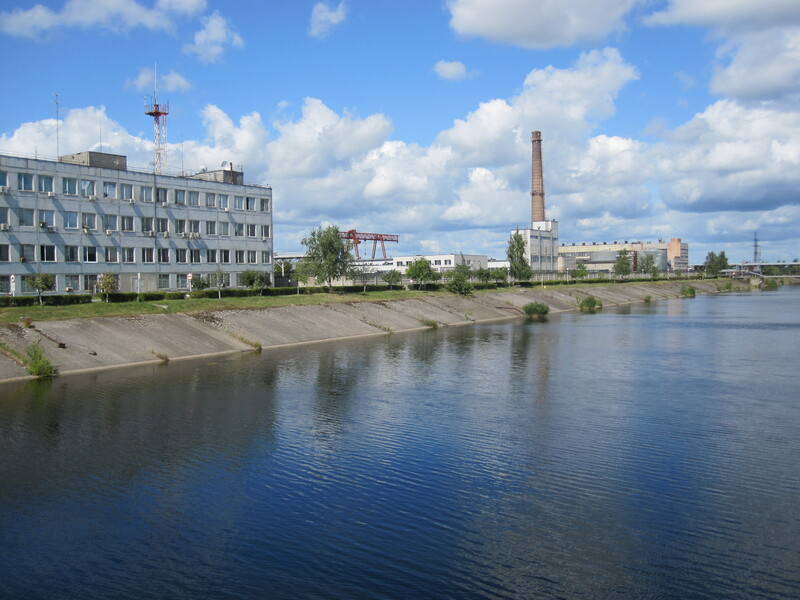 The tower on the left is the site of Chernobyl Reactor #4. Driving past this point of the power station, we were advised that photography was prohibited. Naturally, I took this photograph to serve your viewing needs, dear readers, but this picture is necessarily clandestine and sadly reflects that in its shaky quality. 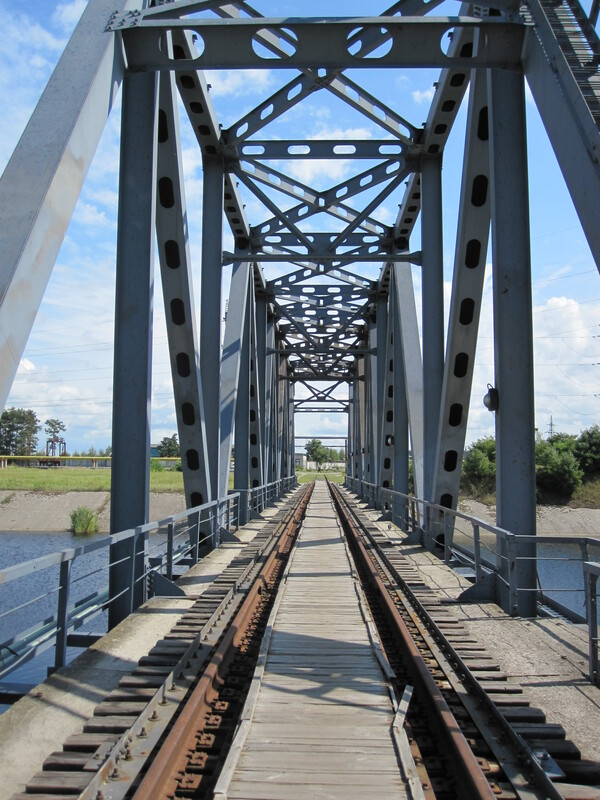 Pulling in to the power station, we were led to this railroad bridge that spans the canal seen in the earlier pictures. In the canal directly below us, we could see the water churning with catfish and trout. A loaf of bread was passed around and we took turns throwing pieces of it into the water, watching as the bits of bread were devoured by the absolutely enormous catfish below. Seriously, these catfish are massive – easily hundreds of pounds and bigger than an adult human. I tried taking pictures of them, but the glare from the sun on the water ruined the pictures. We were soon joined on the bridge by a group of power station workers (The power plant is slowly being decommissioned) who had brought along their own bread to feed the monster catfish. Not a bad way to spend your cigarette break, I suppose. 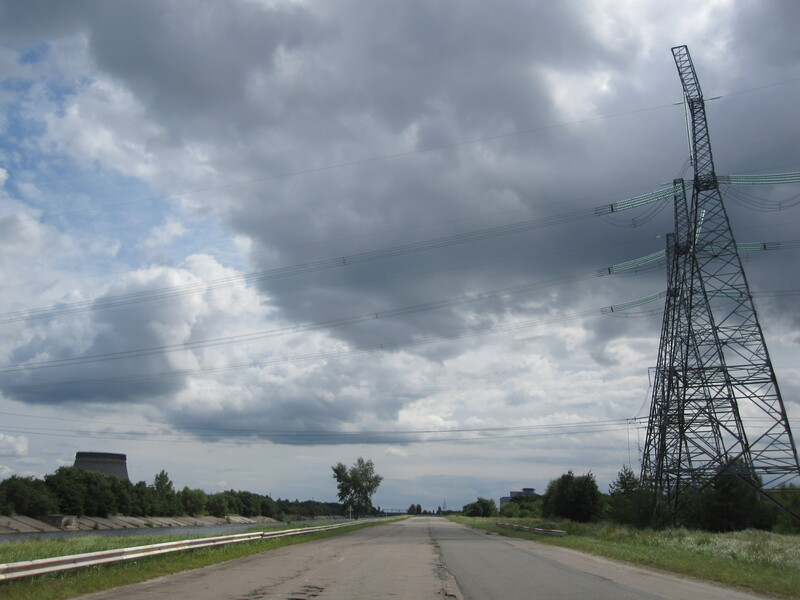 I stroll across the bridge and snap these additional pictures of the Chernobyl nuclear complex. Click, click, click goes the Geiger counter in the background. These are the headquarters of the nuclear complex. They represent the best in Soviet architecture. There are plenty of signs like this around. Just in case you forget where you are, I suppose. 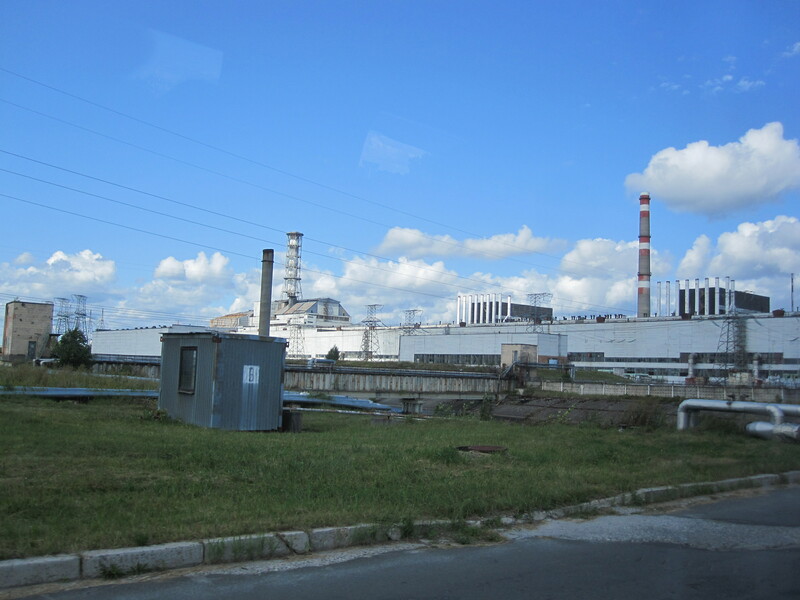 But, we were off because Reactor # 4 is just around the back, on the westernmost edge of the nuclear power station. Now, Reactor # 4 is a massive structure as following the 1986 disaster a concrete and steel “sarcophagus” was built around the site to contain the radioactive materials inside. One problem – the sarcophagus is beginning to crack and leak. However, we were assured that the government of Ukraine is “working on the problem”. At the moment all that can be seen of Reactor No 4 is a building encased in concrete: there appears to be no human element at all. It was a very different scene on April 25, 1986. 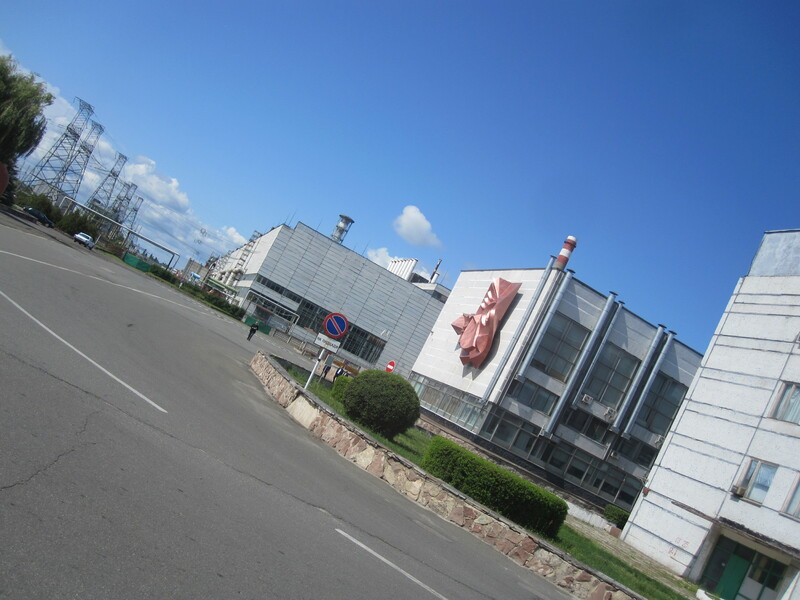 Reactor # 4 was shut down for routine maintenance; plant officials thought it would be a good time to see if enough electrical power could be maintained to operate emergency equipment and the cooling pumps for the reactor core. At 1 a.m. on April 26 it all went wrong. As the system began to break down, the reactor was starved of water and temperatures rose dramatically. Operators could not prevent a power surge, estimated at more than 100 times normal levels. The increase in temperature caused part of the nuclear fuel tank to rupture. Fuel particles then mixed with water, triggering a steam explosion that destroyed the core. A second explosion two minutes later finished it off. Thousands of tons of radioactive dust and debris escaped, sending a deadly radioactive cloud over Ukraine, Russia, Belarus, Western Europe and eventually the whole northern hemisphere. 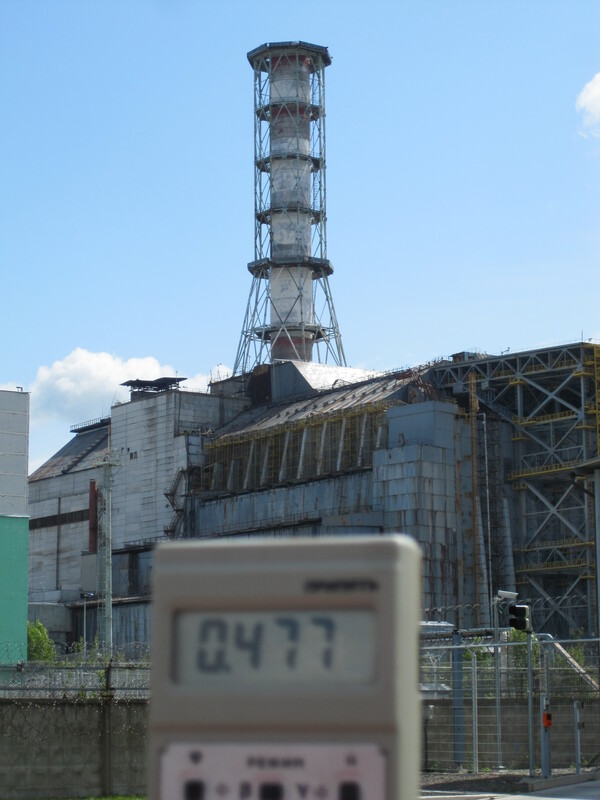 I held up the Geiger counter to the reactor and you can see it begins to steadily climb. It is estimated that more than one hundred times the radiation of the Hiroshima bomb was released during the accident — the equivalent of 50 million to 250 million grams of radium. More than 40 different radioisotopes were released, and there was a measurable rise in cesium-137 levels across the entire European continent. A parting glance – You are by the biggest radioactive leak in the world and should savor the moment because it isn’t safe to stay here for very long. * 30 people were immediately killed by the explosions. * From 1986-87, 240,000 people took part in the clean-up operations at the plant and up to 30km around. The clean-up continued until 1990 and eventually involved 600,000 people including scientists, miners, and Soviet military conscripts. * 116,000 people were evacuated from the surrounding area in 1986; later a further 220,000 people were relocated in the former Soviet republics of Belarus, Ukraine and the Russian Federation. 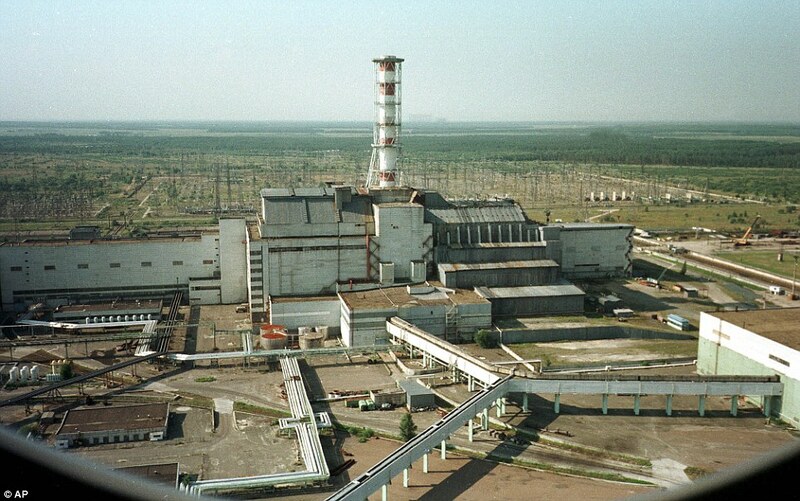 * Highest radiation doses were received by about 600 emergency and plant workers on site the night of the accident. An estimated 100 people died almost immediately, but because of Soviet failure to keep records, the exact number is not known. I strongly recommend the documentary: The Battle of Chernobyl for further information on this event. 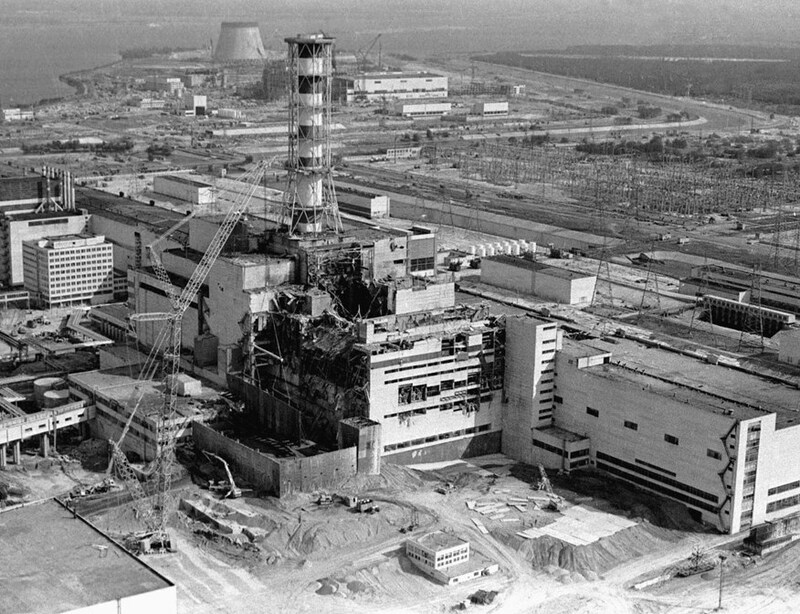 Among other interesting tidbits, it explains the real death toll of the Chernobyl disaster as well as describing how close the Reactor # 4 explosion came to triggering a secondary nuclear explosion that would have made most of Europe uninhabitable. Tags: Chernobyl, Chernobyl Reactor 4, Chornobyl, Disaster Tourism, Justin Ames, Nuclear Disaster, Nuclear Tourism, Visiting Chernobyl. Bookmark the permalink. 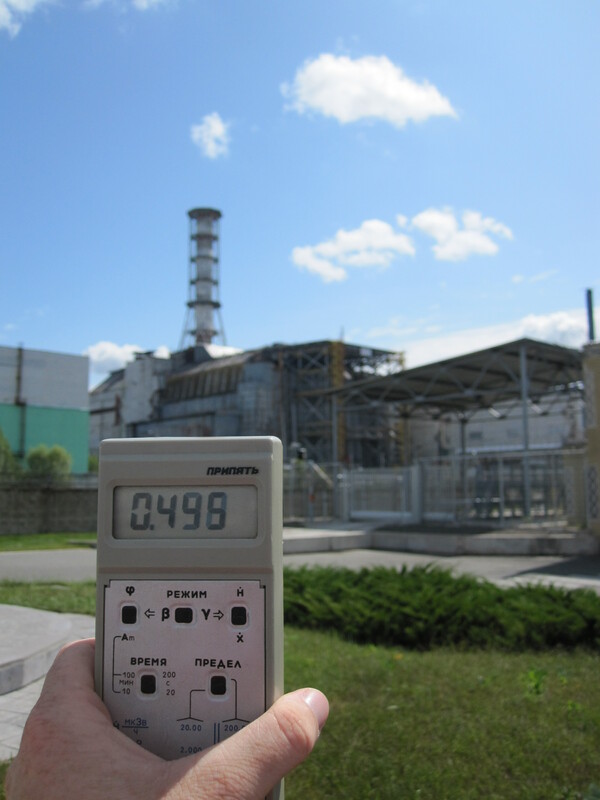 There are some problems with more and more people visiting the Chernobyl Zone. There have been a few visitors who have caused more damage to the buildings or have tried to take things out of the Zone. It is a complete lack of respect. 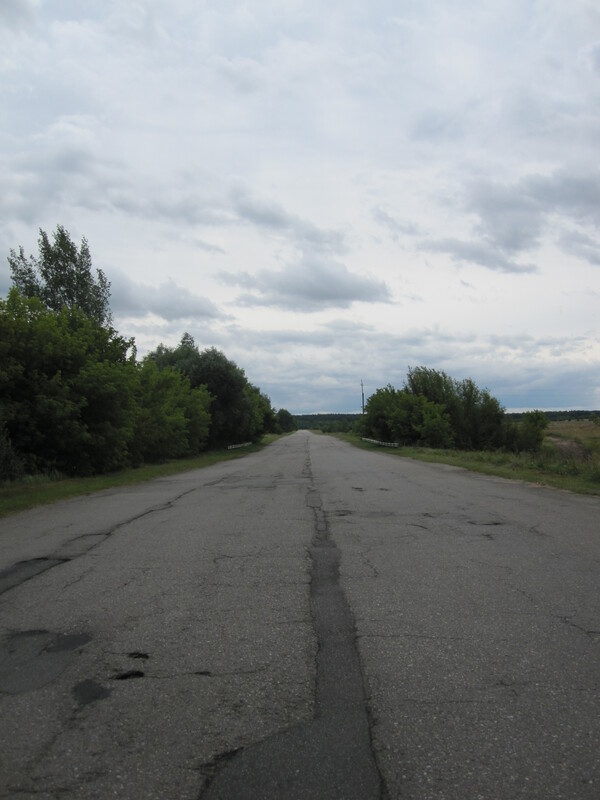 Traveling to Chernobyl is a serious endeavor and should not be taken lightly. It is always regrettable when the masses begin to visit our favorite places. 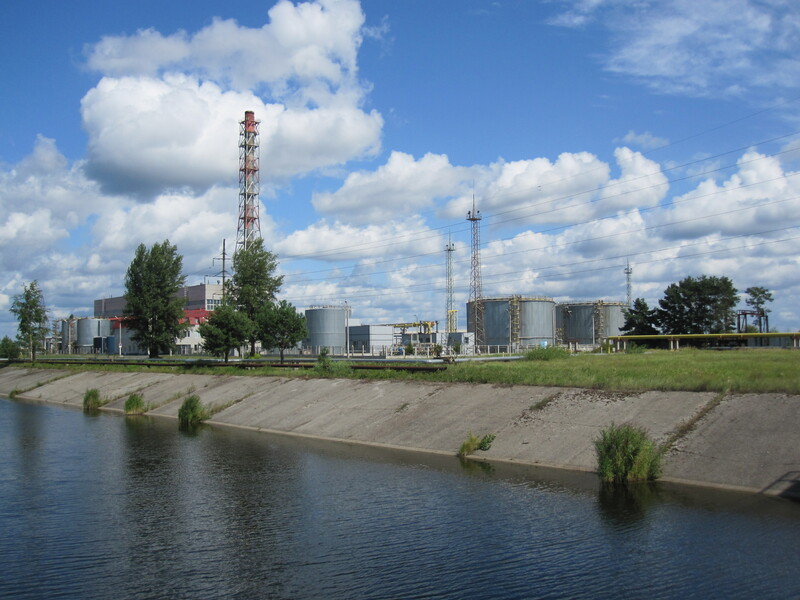 However, such is life – particularly around a site such as Chernobyl. Should people not visit the concentration camps of Auschwitz and Birkenau? Should people not visit the site of Pompeii? Or Mount St. Helens? Are those not also disaster sites? I disagree that such trips should not be taken lightly for I feel that is exactly how they should be taken. Life is short enough already, why give death more weight than it already has or deserves? The ultimate celebration of life is to be light in the face of death and adversity. I completely agree with Justin. Life is short enough, as a consequence, I don’t think we should take ourselves too seriously. 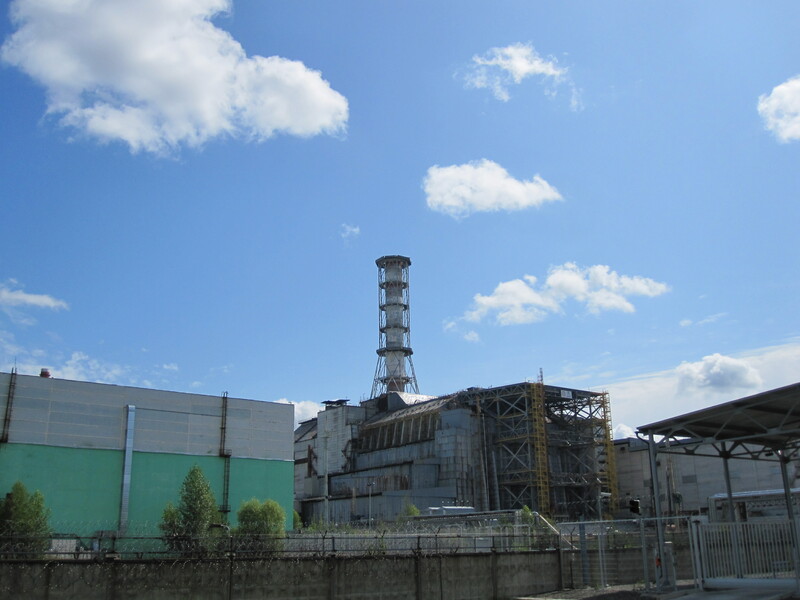 Disasters happen all the time, there was, there is and there will always be a huge amount of suffering and pain out there, so if the Chernobyl Power Plant is visitable, and we can experience an enjoyable trip… why not? We should make the best out of our already miserable and limited lives. My comment was not to give more weight to death. This is not just a disaster where something happened and the danger has since passed. The reason I say not take a Chernobyl trip lightly is because unlike visiting concentration camp sites, Pompeii or Mt. St. Helen’s, there is still a real danger to visitors’ health. Chernobyl is not an amusement park where people go to have fun. People spray-painting graffiti on the buildings in Pripyat is as inappropriate as doing the same thing in Pompei or on Mayan ruins in Central America. If people want to risk their lives by doing something stupid, there are a lot of things they can do without traveling to Chernobyl and breaking the rules. Speaking of breaking rules, the Ukrainian government has imposed many rules for visiting Chernobyl, all with people’s safety in mind. If visitors continue to break those rules, the Zone will become off-limits to future visitors sooner, rather than later. That means that other people doing stupid things could affect your ability to visit the Chernobyl Exclusion Zone in the future. I know of some trips to Chernobyl that were cut short because one person broke the rules. I’m all for having fun on trips, but I don’t need to break rules or treat a potentially dangerous situation lightly in order to have a good time. Among plant employees and firefighters at Chernobyl, many volunteered to try to tame, and then entomb, the burning reactor — although it is not clear that all were told the truth about the risks. Within three months, 28 of them died from radiation exposure. At least 19 of them were killed by infections that resulted from having large areas of their skin burned off by radiation, according to a recent report by a United Nations scientific committee. And 106 others developed radiation sickness, with nausea, vomiting, diarrhea and dropping blood counts that left them highly vulnerable to infections. The people who had suffered radiation sickness developed other problems later, according to the report: cataracts, severe scarring from the radiation burns to their skin and an increased number of deaths from leukemia and other blood cancers. Really good article. I was just wondering though, for layman reasons, 0.498 *what* – i.e. what was the unit of measure and what is considered background i.e. normal for that digital reading – as a reference – thanks.